Recently renovated, the Brooklyn Hotel in Rivazzurra is a family run 3 star hotel located near the sea. It offers services designed especially for families with children and has parking, WI-FI and air conditioning. Admits animals of small and medium size. This hotel joins the Green Booking and has decided to donate a tree to the coast for a healthier environment and a more sustainable tourism. 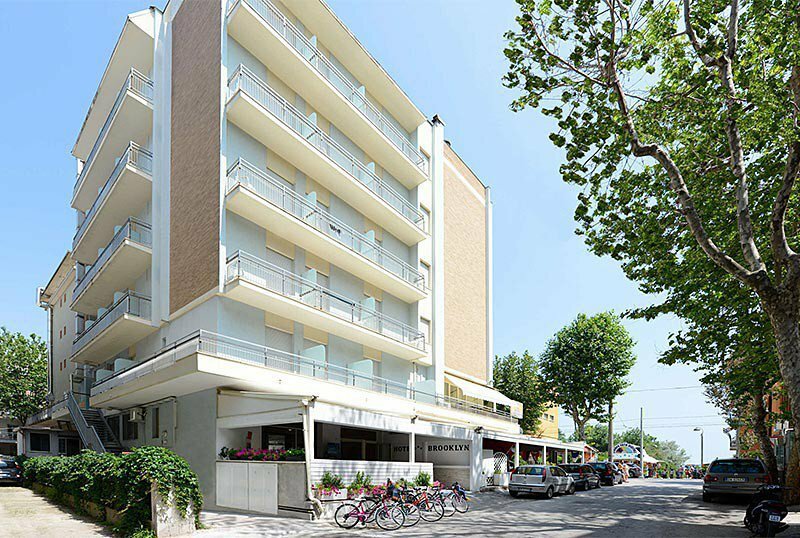 The hotel directly faces the Rivazzurra seafront in Rimini, to reach the beach it is sufficient to cross the street. The area is well connected by public transport, with the bus line n. 11 you can reach the nearby city of Riccione and the historic center of Rimini in about 20 minutes. Also close to the theme park of Fiabilandia which is 15 minutes walk. The rooms all have a balcony - most with sea view - independent air conditioning, LCD digital terrestrial TV, safe, telephone, free WI-FI and private bathroom with shower or curtain and hairdryer. On request: minibar. FAMILY: available solutions ideal for groups and families. Equipped terrace, free use of bicycles, lift, bar, TV room with newspapers in consultation, internet point. Finally, the staff organizes theme nights and aperitifs on a weekly basis. PARKING: free, guarded and fenced. Outside the building and guaranteed for all guests. AIR CONDITIONING: free and available in all environments. CONVENTIONS: beach, amusement parks, spas and nightclubs. Transportation and free entry to the Beach Village water park. Shuttle service and organized excursions (both on request). SERVICES FOR PEOPLE WITH DISABILITIES: room with wheelchair maneuver, wheelchair access shower. BREAKFAST: buffet with homemade desserts and savory dishes. LUNCH AND DINNER: 3 first and 3 second courses with the best dishes of Romagna and international cuisine. At meals there is always a buffet of fruit and vegetables, water, wine and soft drinks. In the hotel: indoor playground area, strollers, entertainment (baby / mini club). On request: baby sitter and pediatric counseling. At meals: independent kitchen available to mothers for the preparation of meals, flexible hours with meals, high chairs, baby food, pasta, vegetable soups and dedicated menus. The structure has an agreement with the nearby bathing establishments Bagni n. 107, 108 and 109 equipped with beach umbrella and sun beds rental, hot showers, entertainment, fenced baby park, relaxation area, fitness area, entertainment, beach volley and beach tennis courts, pedal boat and canoe rental. all children up to 12 years old sharing the room with 2 adults stay for free. 7 nights in full board All Inclusive for only 580.00 euros including the tourist tax. See all the details in the special offer: "Beginning of June, All Inclusive and free children"
From 9 to 16 June, all children up to the age of 5, in a room with 2 adults, will be completely free! 2 adults plus child up to 5 years, for 7 nights for only 700.00 euros including the tourist tax. Offer 7 nights in full board All inclusive, see all the details in the special offer: "9-16 June at the sea"
From 28 July to 4 August, all children up to 2 years, in a room with 2 adults, will be completely free! 2 adults plus child up to 2 years, for 7 nights for only € 1,000.00 including the tourist tax. Offer 7 nights in full board all inclusive, see all the details in the special offer: "Special from July 28th to August 4th: all inclusive and baby free"
7 nights from 2nd to 9th June All Inclusive for only 580.00 euros including the tourist tax. Children up to 12 years old, sharing the room with 2 adults stay for free. 2 adults + child up to 5 years, for 7 nights for only 700.00 euros including the tourist tax. - admission and transport to the daily beach village water park. Book your family holiday at the 3-star Hotel Brooklyn 2 steps from the sea! Children up to 2 years in room with 2 adults Free!